It’s time for another Dinner under $10 recipe thanks to Everyday with Rachael Ray ! Today’s recipe is Roasted Tomatoes with Shrimp and Garlic Bread Stuffing and it is in the May issue of the magazine. To see more dinner recipes under $10 you can go to my dinners under $10 category. Preheat the oven to 425*. Arrange the garlic bread on a baking sheet and bake until toasted; let cool. Meanwhile, scoop out the tomato flesh and seeds and coarsely chop; transfer to a small bowl. In a large bowl toss the tomato halves with 3 tablespoons olive oil; season with salt and pepper. Arrange cut side up on a foil-lined baking sheet, sprinkle with 1 tablespoon basil and bake for 3 minutes. Meanwhile, cut the garlic bread into cubes. Using a food processor, process into crumbles; transfer to a medium bowl. in a large skillet, heat the remaining 2 tablespoons olive oil over medium-high heat. Add the onion and garlic and cook, stirring occasionally, until softened; season with salt and pepper. Add the tomato flesh and cook until most of the liquid is absorbed, about 3 minutes. Add the shrimp and cook, stirring often, until heated through. Add to the garlic breadcrumbs and stir in the remaining 1 tablespoon basil. Preheat the broiler. 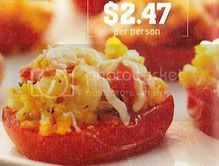 Divide the shrimp mixture among the roasted tomato halves and top with the cheese. Roil until the cheese is melted, about 2 minutes. That looks really pretty. I’m not a big shrimp fan but maybe I can work it out using another kind of meat. I love shrimp! Hubby doesn’t though – not at all, LOL. Previous post: Cat Fancy Magazine $8.41/year Today Only! Next post: Thrifty Family Entertainment – Cloud Watching!